Definition at line 17 of file CREQuestPanel.h. Definition at line 13 of file CREQuestPanel.cpp. 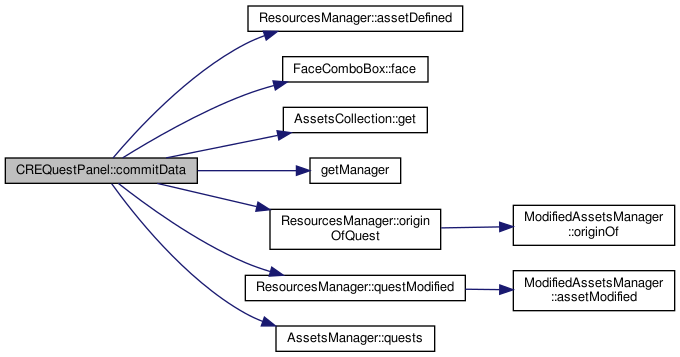 References Quest::code(), deleteStep(), QuestManager::getFiles(), main(), moveDown(), moveUp(), myCanRestart, myCode, myCurrentStep, myDescription, myFace, myFile, myMessageManager, myParent, myQuest, myQuestManager, mySteps, myStepsModel, myTitle, myUse, and QuestManager::quests(). Definition at line 114 of file CREQuestPanel.cpp. Definition at line 186 of file CREQuestPanel.cpp. References QuestManager::findByCode(), QuestManager::getQuestFile(), myCanRestart, myCode, myDescription, myFace, myFile, myParent, myQuest, myQuestManager, myTitle, Quest::setCode(), Quest::setDescription(), Quest::setFace(), Quest::setParent(), QuestManager::setQuestFile(), Quest::setRestart(), and Quest::setTitle(). Definition at line 211 of file CREQuestPanel.cpp. References myQuest, mySteps, and myStepsModel. Definition at line 206 of file CREQuestPanel.cpp. References myQuest, myStepsModel, and CREQuestItemModel::setQuest(). Definition at line 233 of file CREQuestPanel.cpp. References CREQuestItemModel::moveDown(), myQuest, mySteps, and myStepsModel. Definition at line 222 of file CREQuestPanel.cpp. References CREQuestItemModel::moveUp(), myQuest, mySteps, and myStepsModel. Definition at line 118 of file CREQuestPanel.cpp. References Quest::canRestart(), Quest::code(), Quest::description(), displaySteps(), Quest::face(), QuestManager::getQuestFile(), Quest::maps(), MessageManager::messages(), myCanRestart, myCode, myCurrentStep, myDescription, myFace, myFile, myMessageManager, myParent, myQuest, myQuestManager, myTitle, myUse, Quest::parent(), MessageFile::path(), CREMapInformation::path, MessageRule::postconditions(), MessageRule::preconditions(), root, MessageFile::rules(), and Quest::title(). Definition at line 37 of file CREQuestPanel.h. 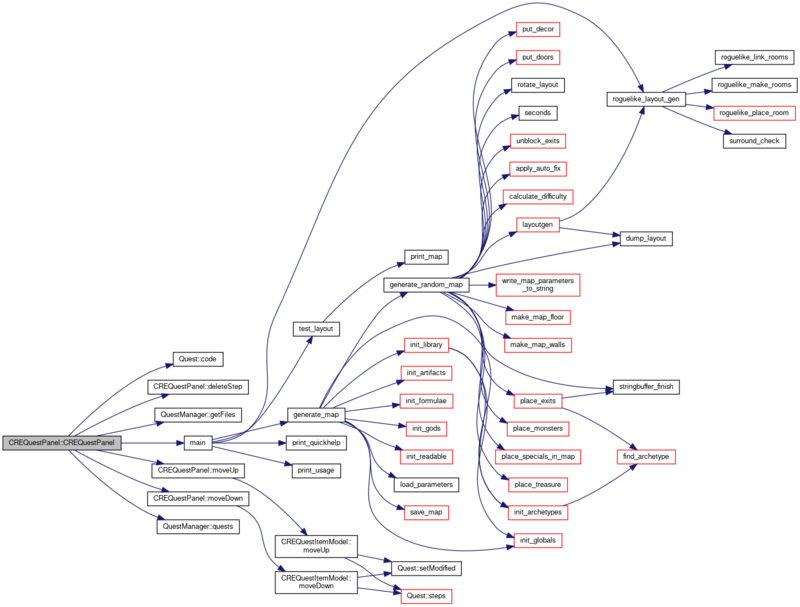 Referenced by commitData(), CREQuestPanel(), and setItem(). Definition at line 33 of file CREQuestPanel.h. Definition at line 32 of file CREQuestPanel.h. Referenced by CREQuestPanel(), and setItem(). Definition at line 39 of file CREQuestPanel.h. Definition at line 35 of file CREQuestPanel.h. Definition at line 36 of file CREQuestPanel.h. Definition at line 30 of file CREQuestPanel.h. Definition at line 38 of file CREQuestPanel.h. Definition at line 31 of file CREQuestPanel.h. Referenced by commitData(), CREQuestPanel(), deleteStep(), displaySteps(), moveDown(), moveUp(), and setItem(). Definition at line 29 of file CREQuestPanel.h. Definition at line 41 of file CREQuestPanel.h. Referenced by CREQuestPanel(), deleteStep(), moveDown(), and moveUp(). Definition at line 40 of file CREQuestPanel.h. Referenced by CREQuestPanel(), deleteStep(), displaySteps(), moveDown(), and moveUp(). Definition at line 34 of file CREQuestPanel.h. Definition at line 42 of file CREQuestPanel.h.